From tomorrow (Jan 1), smokers will have to be 19 years old before they can light up, up from the current age of 18, while Orchard Road will become a smoke-free zone. The Ministry of Health (MOH) has issued a reminder that the minimum legal age for the purchase, use, possession, sale and supply of tobacco products will be raised from 18 to 19 years old from tomorrow. After this, it will be raised progressively every January until 2021, when smokers will have to be at least 21. 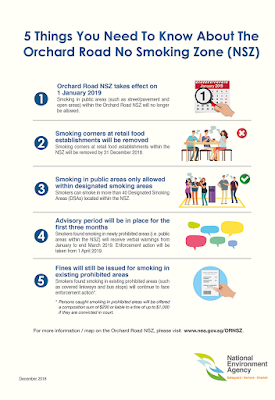 Tobacco use in Orchard Road will also be limited to about 40 designated smoking areas from tomorrow following the removal of smoking corners in eateries. The ban had been slated for July but was pushed back to give businesses more time to prepare. The National Environment Agency (NEA) said that people found smoking in the newly prohibited public areas, such as along the streets and pavements or at open areas, will receive verbal warnings from its enforcement officers and volunteers during the first three months of the ban. Enforcement action will be taken from April 1. The NEA added that surveillance cameras will also be deployed selectively to monitor certain areas within the no-smoking zone, based on feedback. "Raising the minimum legal age is part of the Ministry of Health's ongoing efforts to enhance public health and reduce smoking prevalence in Singapore," MOH said. "It aims to prevent youth from picking up smoking by limiting access to tobacco products, and to further de-normalise smoking, particularly for those below 21." The proposal to raise the minimum legal age was debated and passed in Parliament on Nov 7 last year as part of the Tobacco (Control of Advertisements and Sale) (Amendment) Bill 2017. The move followed public consultations conducted from December 2015 to March 2016, and from June 13 to July 10 last year. The tobacco industry was informed of the changes from January this year. Retailers who contravene the law and sell any tobacco products to a person below the minimum legal age shall be liable upon conviction to a maximum fine of $5,000 for the first offence and $10,000 for subsequent offences. In addition, their tobacco retail licences will be suspended for six months for the first offence and revoked for subsequent offences. People who supply any tobacco products to a person below the minimum legal age are also committing an offence. Those caught buying or acquiring tobacco for a person below the minimum legal age shall be liable upon conviction to a maximum fine of $2,500 for the first offence and $5,000 for subsequent offences. People caught giving tobacco to a person below the minimum legal age shall be liable upon conviction to a maximum fine of $500 for the first offence and $1,000 for subsequent offences. Underage smokers who are caught for using, buying or having in their possession tobacco products are liable upon conviction to a fine of up to $300. Members of the public can report errant retailers to the Health Sciences Authority's Tobacco Regulation Branch on 6684-2037 or 6684-2036 during office hours. MOH said it also seeks the public's support by playing their part and being responsible in not supplying tobacco to persons below the minimum legal age. The ministry added that it remains committed to lowering smoking prevalence in Singapore through a comprehensive approach to discourage and reduce the use of tobacco products. This includes public education on the harms of tobacco use, efforts to encourage tobacco-free living, legislative restrictions on tobacco advertising and promotion, and fiscal policies like tobacco taxation. 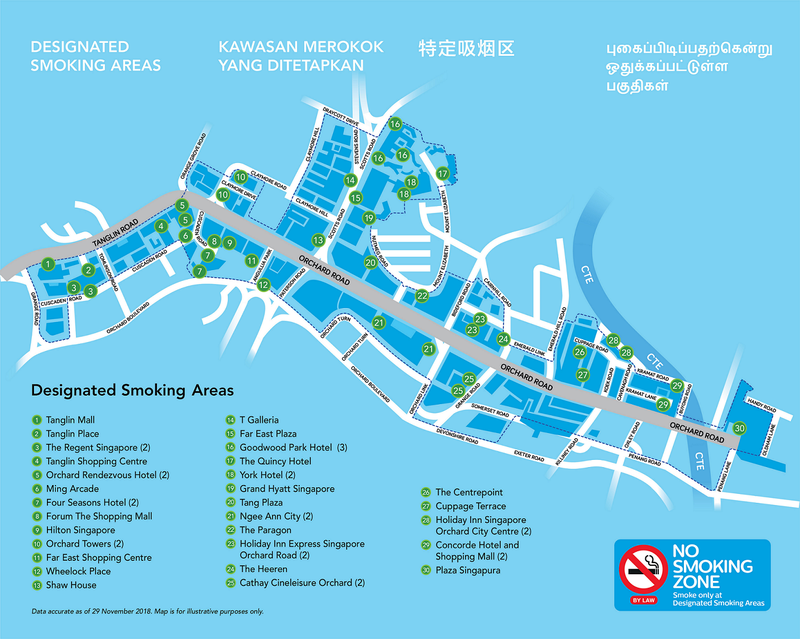 Food establishments within the zone will have their smoking corners removed by today. It is an offence to smoke or hold a lit cigarette or any other tobacco product which is alight or emitting smoke in a no-smoking area. More than 40 designated smoking areas can be found at regular intervals in the zone. The National Environment Agency (NEA) said these designated smoking areas have been set up over the years. The locations of the areas can be found on NEA's website, as well as brochures at shopping malls and places selling tobacco products. Building owners who wish to cater to the needs of smokers can demarcate designated smoking areas on their premises and put up signs leading to them. Operators and managers of premises where smoking is prohibited are required by law to ask smokers to stub out their cigarettes or tell them to leave the premises if they wish to continue smoking. 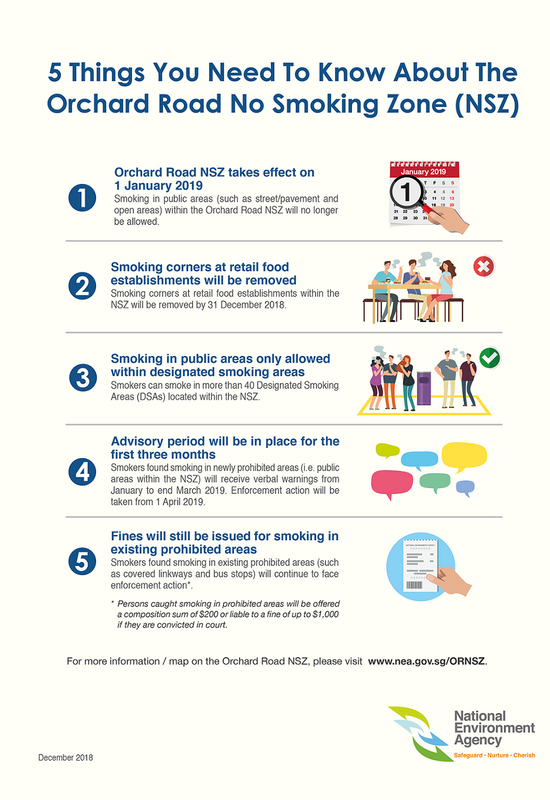 Smokers found smoking in the newly prohibited public areas in Orchard Road will receive verbal warnings or advisories from enforcement officers and volunteers from tomorrow to March 31. NEA said the advisory period is meant to "facilitate the transition for smokers". Smokers who are uncooperative may still be fined. From April 1, enforcement action will be taken against all offenders. The advisory approach does not apply to those who are caught smoking in existing prohibited areas within the zone, such as covered walkways and bus stops. Surveillance cameras will be selectively deployed to monitor certain hot spots and other areas in the zone based on feedback. Signs will be placed on bins and some lamp posts within the zone, and advertisements will be put up at Newton, Orchard, Somerset and Dhoby Ghaut MRT stations, selected bus stops as well as on buses that ply Orchard Road. To keep foreign visitors and inbound travellers informed of the zone, materials will be displayed from tomorrow at Singapore's points of entry such as Changi Airport, Singapore Cruise Centre and Marina Bay Cruise Centre.